Here are the three reasons it’s worrisome. On Tuesday, a House oversight committee released an interim report sounding alarms about a secretive Trump administration effort to transfer sensitive nuclear technology to Saudi Arabia. The plan to help the kingdom build nuclear power plants apparently dates from the early period of Trump’s presidency, before Congress soured on relations with Saudi Arabia after Washington Post contributing columnist Jamal Khashoggi was killed at the Saudi Consulate in Istanbul. Yet the administration apparently discussed the plan as recently as last week, despite national security officials’ objections. As the oversight committee report makes clear, the Trump plan is highly unusual. The United States and other countries that possess nuclear technology have transferred it to nonnuclear countries for decades. But that process, especially in the United States, is sensitive and closely regulated. Here are three things to know about nuclear technology transfer — and what makes the Trump plan different. Nuclear technology has both peaceful and military purposes; it can be used to produce electricity or bombs. As Nobel-winning physicist Hannes Alfvén once put it, the peaceful atom and the military atom are Siamese twins. Trade in nuclear technology can be dangerous because recipient countries gain the foundation for a nuclear weapons program. Nuclear suppliers regulate the nuclear marketplace accordingly. In the United States, the process typically starts when presidents or other senior officials push for nuclear exports, despite their security risks, because they generate revenue for U.S. companies and may help Washington gain political influence with the receiving country. For example, then-Secretary of State Henry Kissinger advocated for nuclear assistance to Iran in 1974 — when Washington and Tehran were allies — because he believed this would provide “concrete evidence of our … interest in developing closer ties” and show that we “attach highest value to a partnership” with Iran. In the next step, U.S. diplomats negotiate a nuclear cooperation agreement (NCA) with their foreign counterparts. NCAs usually require the importing state to guarantee that it will use technology and materials only for peaceful purposes, and will accept international safeguards to verify compliance with this pledge. According to Section 123 of the 1954 Atomic Energy Act, the diplomats’ finalized agreement must be submitted to the president, who must then send it to Congress. Without congressional approval of what’s commonly called a “123 Agreement,” U.S. firms are not authorized to export nuclear technology. The United States has about two dozen 123 Agreements in force with countries that include Canada, Egypt, Japan and the United Arab Emirates — but not Saudi Arabia. The Trump administration has publicly expressed a desire to conclude such a deal. Selling nuclear technology to Riyadh before Congress signed off on a 123 Agreement would be illegal. According to the House committee report, U.S. officials pushing for nuclear cooperation with Saudi Arabia have ignored the legal requirement for congressional approval. Does selling peaceful nuclear technology lead to the proliferation of nuclear weapons? Researchers disagree. According to one view, helping other countries develop peaceful nuclear programs increases the risk that they will ultimately pursue and obtain nuclear bombs. That’s what my own research has found — especially when, after receiving the nuclear technology, materials, and know-how, the recipient country finds itself in a military conflict. By reducing the barriers to bombmaking, foreign nuclear aid makes nuclear proliferation less costly and therefore more likely. For example, after Canada and the United States gave India nuclear technology and materials in the 1950s, India fought wars with China and Pakistan over disputed borders — and then used that assistance to build and test a nuclear explosive device in 1974. Iraq’s Saddam Hussein probably intended to use a French-supplied reactor for the same purpose before Israel destroyed it in a 1981 attack. And before J. Wynand de Villiers headed South Africa’s nuclear explosive program, the United States trained him in “peaceful” nuclear energy. Other scholars dispute the notion that peaceful nuclear assistance leads to nuclear weapons proliferation. Researcher Nicholas Miller, for instance, argues that investments in nuclear energy make countries more vulnerable to economic sanctions, since those would withhold the materials needed to produce electricity — and so might be less willing to risk building bombs. Since nuclear assistance brings factors that push nations both toward and away from building nuclear weapons, he contends, the net effect is neutral. Certainly, several countries — Belgium, Mexico, the Netherlands and others — have developed nuclear energy programs without seriously pursuing nuclear weapons. And researchers Matthew Kroenig and Alexander Montgomery show that peaceful nuclear assistance does not make weapons proliferation statistically more likely; it may actually decrease this danger. So how would Saudi Arabia respond to nuclear assistance? So how would Saudi Arabia respond to nuclear assistance? With its vast oil and natural gas reserves, Saudi Arabia’s immediate need for nuclear power is not critical. But it is in a dangerous neighborhood and has already waged proxy wars with Iran and other regional rivals — and will likely have such conflicts again. If my research is correct, that combination of security threats and nuclear assistance would give the Saudis both the will and opportunity to build a nuclear arsenal. International safeguards would make it more difficult for Saudi Arabia to use its nuclear knowledge and supplies into weapons. But a Saudi Arabia with a well-developed peaceful nuclear program is probably more likely to behave like Iraq or India than Belgium or the Netherlands. So why would the Trump administration want to transfer nuclear technology to Saudi Arabia? Peaceful nuclear assistance can be an effective tool of statecraft. Such aid sends the message: “You are important to us; you are one of the select few countries we’re willing to trust with nuclear technology.” This can make the recipient act in ways that serve the supplier’s political and economic interests. As I showed in my 2012 book “Atomic Assistance,” countries use nuclear programs to shore up relationships with allies, politically strengthen strategically important countries and gain access to oil. 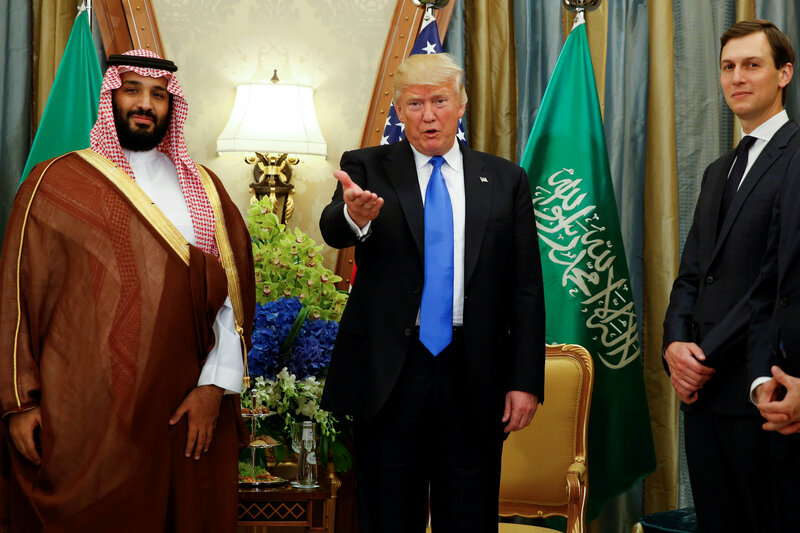 Now that the relationship between Washington and Riyadh is rocky, the Trump administration might be looking to signal to the Saudis that they remain an important ally. It may see nuclear assistance as the perfect remedy for a frayed bilateral relationship. Selling nuclear technology to the kingdom would also line the pockets of close Trump associates, as the House committee report mentions. Yet this comes with a risk: It could lead to a Saudi nuclear bomb. Matthew Fuhrmann (@mcfuhrmann) is professor of political science at Texas A&M University and author of “Atomic Assistance: How Atoms for Peace Programs Cause Nuclear Insecurity” (Cornell University Press, 2012) and the co-author of “Nuclear Weapons and Coercive Diplomacy” (Cambridge University Press, 2016).